The Basics & Beyond is an interactive digital online learning has been completely updated with content, photos, and the BRAIN GAME quizzes through each chapter. This is a great review course for CHTs looking to obtain CE hours which will apply for category A renewal for an amazing price. 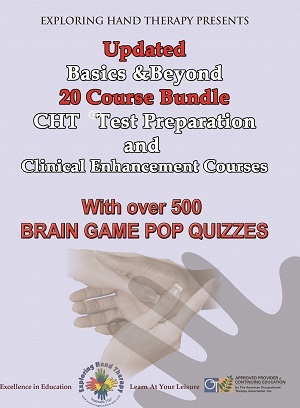 This 67.75 AOTA approved CE course has been rated by HTCC test takers as one of the most popular preparation courses for the CHT exam. Earn 67.75 credit hours! Under $9.00 per credit hour.